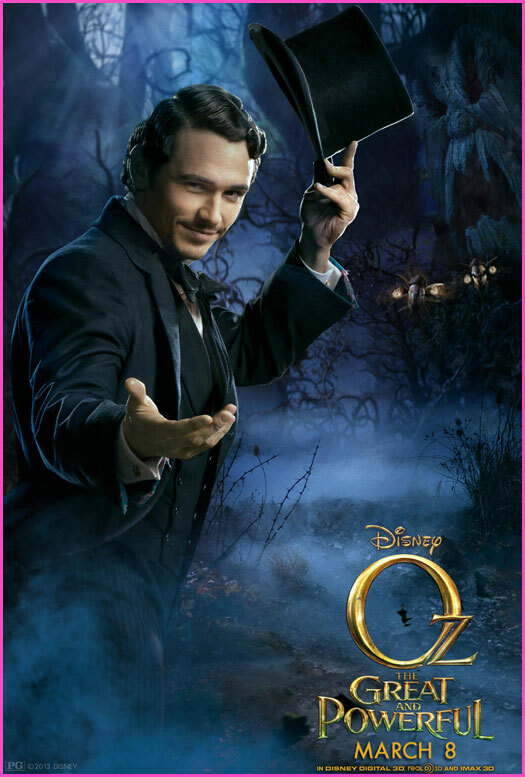 a few weeks back, i posted an email from disney that included an animated gif for "oz the great and powerful". i alluded to how much i was looking forward to seeing this movie. having never read any of oz books, i wasn't in the know of what to really expect. but having seen wicked three times now - in nyc, chicago, and san francisco - i was intrigued at how disney would respect that popular story line. as i said the movie didn't disappoint! and with all the media blitz, and the months and months of media hype, i am surprised how well they kept the secrets! i'm not going to give them away, but i am going to tell you now, that if you have considered getting a 3d television, this movie will make you go to amazon and purchase one! the opening scenes are filmed in a square letterbox, and in sepia-tones like the original wizard of oz from 1938. as our hero is swept up in a balloon in a twister, the viewer experiences multiple sight gags that are part of the 3d experience. being a theme park junkie, well disney world junkie, i am not without my experiences of seeing 3d attractions and playing along with the rest of the audience to reach out for bugs, or dodge a spear, or whatever else the imagineers bake into those productions. i know those things aren't there, but it's part of the fun to play along with the kids... i saw the movie in imax 3d, and shortly before the letterboxing slides away, our hero oz experiences snow, and so does the audience! the snow actually extends past the letter boxes and the effect is so realistic that the person i was with and myself both turned to each other and said, "this is freaky". it was this sight gag that has convinced me to purchase a 3d tv because i can't wait to own "oz the great and powerful"! that said, the 55inch samsung 3d smart tv was delivered today - unfortunately, unlike spaceballs the movie, oz the great and powerful isn't available on dvd/blue-ray yet. if you haven't seen oz yet, i highly recommend you going to see it - and go see it in imax 3d. the adventure is beyond colorful! once the tv is fully set up and configured, i'll report back on the latest piece of technology to hit the house!